Want to give your artwork and illustrations a bit of pop? Try adding brightly colored text with a bold halftone line gradient. The character panel can't create this kind of text effect, but you’ll find it easy enough to do yourself. I’m using Adobe Photoshop CS6, but CS4 or CS5 will work just as well. Open Photoshop and choose File > New. You’ll need to work at a fairly large scale, so create a document that is 2100 pixels wide by 1200 pixels tall, with a resolution of 300 pixels per inch. Once that’s done, set up a background color. Choose Layer > New Fill Layer > Solid Color. 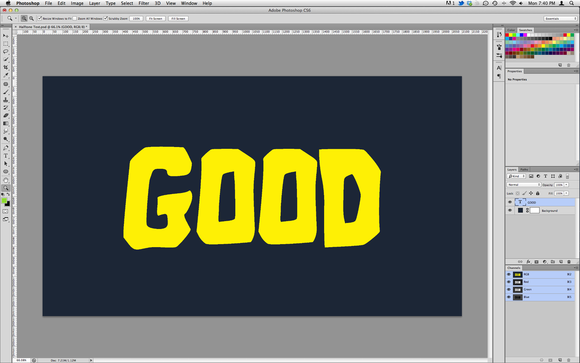 Name the layer Background and click OK. Now choose a color you like; in my example, I’ve selected a deep navy. Click OK to continue. Now let’s pop in a practice word. Select the Text tool, choose a heavy typeface, and set your text size to roughly 100 points. Enter a word, and then choose the Move tool to leave the text-editing mode. Now center the word in your document by choosing Select > All and then Layer > Align Layers to Selection > Horizontal Centers, followed by Layer > Align Layers to Selection > Vertical Centers. Finally, make sure the Layers Panel (Window > Layers) and Channels Panel (Window > Channels) are visible. These panels are usually in the same Tab Group, but it’s helpful if you can see both at the same time. This halftone fill technique works best with large, heavy lettering. Note: These instructions rely heavily on layer masks, which can be a tricky concept for a novice to understand. In short, a layer mask tells the application what parts of the layer to show. Say you have a piece of red construction paper, which you've laid flat on a table. Now you take a piece of black construction paper, and you cut a circle in the middle of it. You then lay the black paper perfectly flat over the red paper, so that all you see is a red circle in the middle of the black construction paper. The black construction paper is functioning as a mask, blocking the view of the rest of the red paper. This is exactly how layer masks work, with one important difference: Areas of black in layer masks are actually transparent. As a result, in Photoshop, laying such a black mask over a red solid-color-fill layer would produce a red circle, but the black border wouldn't be visible. Step 1: Command-click the text-layer thumbnail to select the text. You’re not actually after the text itself; instead, you’re capturing the pixel dimensions of the word. Step 2: Choose Edit > Copy and then click File > New. Photoshop will suggest a document size equal to what you have in the clipboard. To be more comfortable, expand that size by 20 to 30 pixels in each direction. Step 3: In the new file, choose Layer > New Fill Layer > Gradient. The name of the layer is unimportant, so just click OK. The Gradient Fill window then allows you to determine the shape, color, and direction of the gradient. You’re just looking for a basic black-to-white gradient. 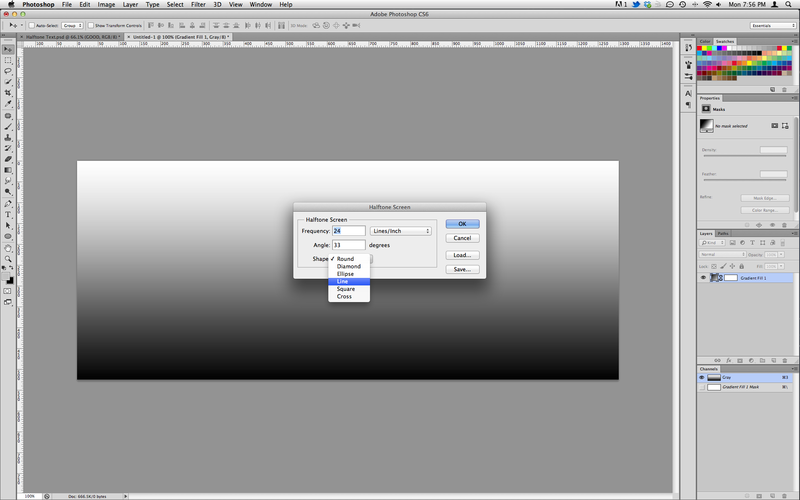 Click the gradient preview, and Photoshop will take you to the Gradient Editor. Along the top, you’ll see a selection of presets; the third one will be a black-to-white gradient. Click it to choose it, click OK to return to the Gradient Fill window, and then click OK to add the gradient layer. Step 4: Choose Image > Mode > Grayscale (and if necessary, click OK to discard color information). Then select Image > Mode > Bitmap and click OK to flatten layers. Now you need to set the Output. Full-color printing (antialiased)—Choose an output of 1200 pixels/inch. This will create a document that is four times the size of your original. Set the method to Halftone Screen and click OK.
Screen printing (aliased)—Choose an output of 300 pixels/inch. This selection keeps the document size the same. Set the method to Halftone Screen and click OK. The shape of the halftone screen determines the how the gradient looks when you convert it to bitmap. We’re using Line in this example, but you might instead try Square or Cross for an interesting effect. Step 5: It’s time to move the gradient back to the original document. Full-color printing (antialiased)—Choose Image > Mode > Grayscale. Now enter a Size Ratio of 4 and click OK. This action returns the file to original size, and in the process, antialiases the bitmapped gradient. Now choose Select > All and then Edit > Copy. Screen printing (aliased)—You have no need for conversion back to grayscale. Simply choose Select > All and then select Edit > Copy. Step 6: Return to your original document. Full-color printing (antialiased)—Command-click the text layer to select it (if it’s not already selected). Screen printing (aliased)—Control-click the text layer to call up the layer options pop-up menu, and then choose None. This action removes the antialiasing from the text. Now Command-click the text layer to select it. Once that’s done, you can add a second color to create the gradient. Choose Layer > New Fill Layer > Solid Color and name it Secondary Color. Notice that the color fill appears only within the word; this happens because the text selection you just made created a layer mask. Choose the color you want and click OK. Now take notice of the layer itself in the Layers Panel. At the right of the solid-color thumbnail, you will see the layer-mask thumbnail, which was derived from the selection you just made. The word appears in white against a black backing, and it's that black area that tells the layer where to be transparent. Step 7: Click your new color-fill layer to select it and then choose Layer > New > Group from Layers. Name the group Halftone Pattern and click OK. Now click Layer > Layer Mask > Hide All. This step adds an opaque (all-black) mask to the group, so the new color will temporarily disappear. Step 8: It’s time to add the halftone by pasting it onto the layer mask. Click the group's layer-mask thumbnail to select it, and then go to Channels. Under RGB and the Red, Green, and Blue channels, you will see the mask layer for the group in italics: Halftone Pattern Mask. Choose it and then click the eye-icon area to make it visible. The mask then appears as a transparent color (usually red) over your document. Now select Edit > Paste to pop in your halftoned gradient from the other document. Carefully use the Move tool to position it over the text you want halftoned, and then click the eye icon to hide the mask layer. You should now see the gradient over the word—the white areas of your new halftone mask will appear in the color of your second fill layer. Once you’ve pasted the gradient into the group layer mask, it will appear over your text. After you’ve created the halftone layer, you can change the colors and tweak the artwork. One of the easiest effects to create is a beveled look, which you can accomplish by contracting and repositioning the mask on your solid-color-fill layer. Command-click the mask thumbnail of your second fill-color layer to select the mask of the word. Now choose Select > Modify > Contract. In the Contract Selection window, enter a value of 10 and click OK. The next step requires that you have the default foreground and background colors in place, so look to your keyboard and tap D. Now choose Select > Inverse and press Delete. This step shaves a thin border off the word mask, contracting the area that the gradient appears in and giving the word the appearance of being slightly beveled. Finally, choose Select > Deselect, choose the Move tool, and then use the arrow keys to move the mask down and to the right. This will give the impression that light is hitting the text from the top left. Contract and reposition the mask to give your text a beveled effect.